Located at the southern tip of Borneo in Indonesia, Banjarmasin is the self-proclaimed "City of 1000 Rivers." With a population of 720,000, it is undergoing rapid physical, economic and environmental transformation due to urbanization and climate change. Most residents battle with the water coursing through rivers, canals and tributaries throughout the city to maintain their homes and livelihoods, especially those living in informal settlements on the riverfront, which are some of the most dense in Southeast Asia. 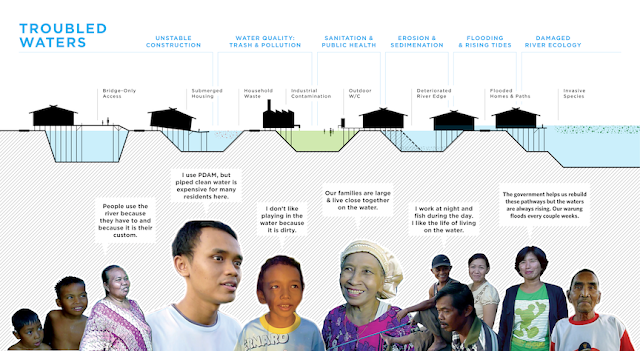 When Alice Shay and Stephen Kennedy, planning students at the Massachusetts Institute of Technology, were working with Solo Kota Kita (SKK), an Indonesian-based NGO, in Banjarmasin in June 2011, the pressing nature of water issues in the city became crystal clear. Along with local architecture students Addina Nur Amalia and Bima Pratama Putra, they developed a proposal to address the challenge. Their project aims to reduce the vulnerabilities faced by local residents due to unstable construction, flooding and sanitation and address the need for improved public spaces in the city’s waterfront neighborhoods. They propose an urban design strategy that uses gabions — block-shaped foundational building materials made of local materials, such as stone — as a platform for different sets of structural, utility and ecological infrastructures. 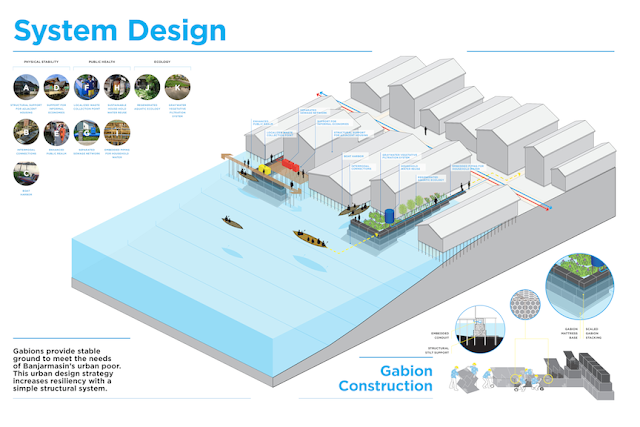 Considering that neighborhoods have many similarities but different needs, their project aims to create a kit of parts, where gabions have multiple applications according to need — for example, they can serve as foundations for structural support for housing and small-scale commercial establishments, water-cleaning aquatic vegetation or platforms for intermodal transit. As a landscape mechanism, the gabion allows a high degree of flexibility for local stewardship of the intervention. Since local communities are very active in maintaining and upgrading existing structures, the team recognized the importance of a new structural system that residents can implement and maintain themselves. 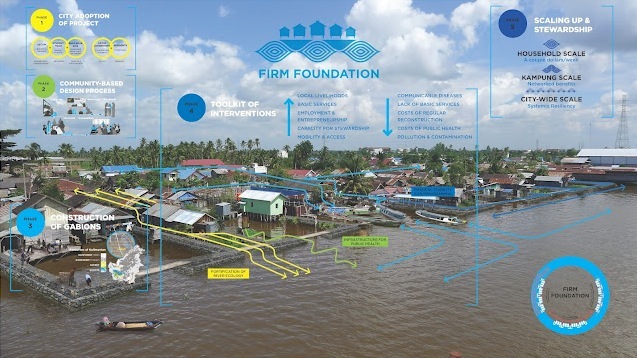 At the end of last year, the group won AECOM’s annual Urban SOS competition to further develop and implement their proposal this summer through a participatory design campaign called Firm Foundation. As they carry out their proposal on the ground, they will produce a field guide to document the Firm Foundation project and offer "how-to's" on organizing participatory urban design processes. This summer, Addina, Alice, Bima, Stephen and the SKK team are coordinating a set of participatory workshops, including do-it-yourself techniques for improving infrastructure along Banjarmasin’s waterfront, in collaboration with neighborhood leaders and the local government. While the team has some financial and engineering support from AECOM and the local government, they recently launched a Kickstarter campaign to create social design field guides that document how to interact with local neighborhoods and conduct research through a participatory design process. Banjarmasin is a test case. 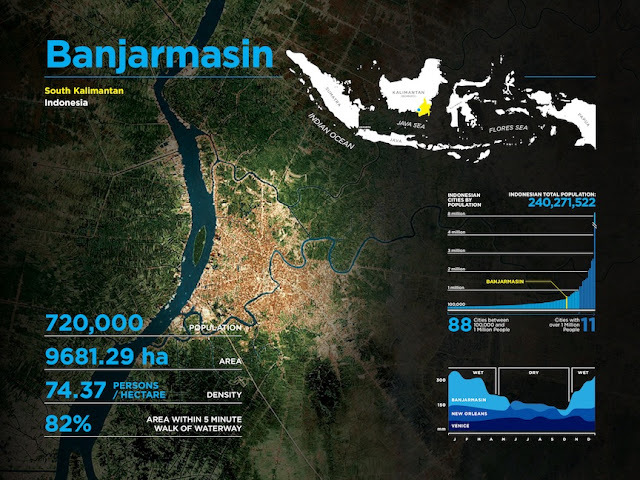 If successful, this pilot project has the potential to be scaled up to other cities in Indonesia to address urban vulnerabilities in waterfront areas that abound across the country. Credits: Images from the Firm Foundation SOS report, courtesy of Alice Shay and Stephen Kennedy.